for the first time since i moved, i had to come back stateside for a work meeting. because amazon prime isn’t reeeeally a thing in mexico (i mean, it is, but it’s mostly imports that are double the price and take 2 months to show up), i decided to stock up on some staples. as much as i absolutely love being an expat, there are some things that are just plain unavailable to me now. for example – literally all of my supplements. talk about a pain. good news – amazon prime carries everything i love, so stocking up on trips to the homeland is easy. i just hope my bag is under 50 pounds for the flight back! please remember i am not in any way a healthcare professional and you should talk to yours before making any changes*. ps – 0% of this is sponsored. i used my own dough for these babies at full price. sun warrior vegan & organic protein powder – this is made of a blend of multiple sources of organic plant protein with a full amino acid profile, and it doesn’t contain rice protein. this is the best blend i’ve ever found. other vegan protein companies – please stop using rice as a plant protein source. other vegans – let’s stop saying you can’t be protein deficient. if you don’t learn how to eat properly on a plant-based diet and get a feel for what you need to hit your daily macros, you probably won’t get enough. supplementing is perfectly fine and sometimes necessary. 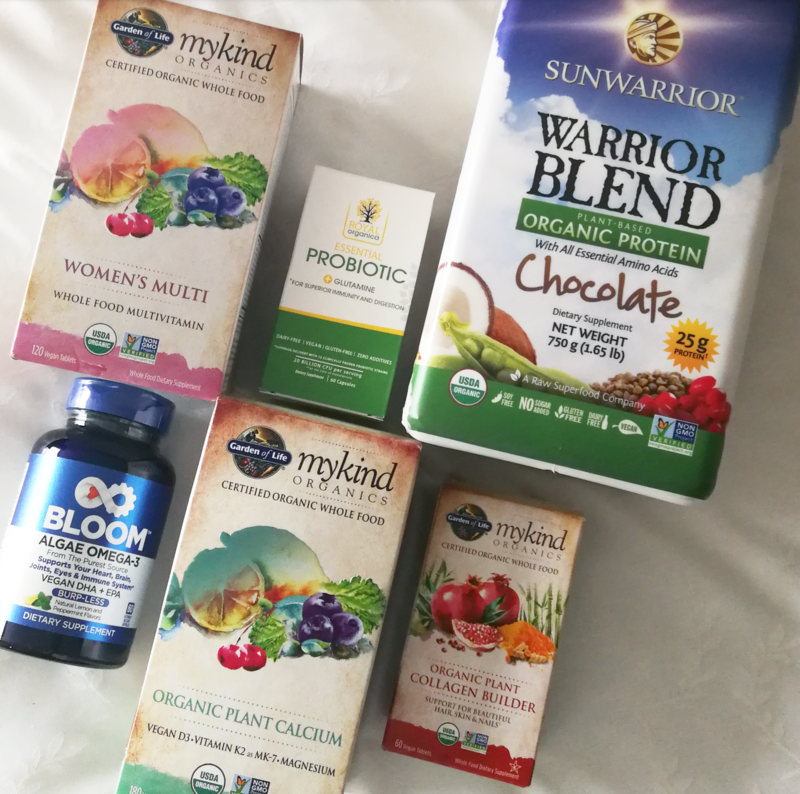 mykind organics vegan whole food plant calcium – same brand, same concept of food pressed pills. A+. mykind organics vegan whole food collagen builder – this is an extra dose of biotin & other vitamins and minerals for hair, skin, and nail health. same brand of whole foods pressed into pills. yesss. bloom vegan algae omega-3 plus dha/epa – i’ve personally found it to be hard to get a good dose of omega-3s in my normal diet. these capsules are straight from an algae source and are the only ones that do not contain any unnecessary additives or caramel coloring that i’ve seen on the market. where do you think fish get their omega-3s from? algae. thanks, plants! royal organica vegan probiotics – i personally think this brand is one of the best vegan probiotics. it contains prebiotics for your bacteria friends to eat, plus l-glutamine for healthy gut linings, and no crappy fillers. talk about a power-packed probiotic! what supplements do you swear by? do you like any of these? share below!